Winthrop Liquors is just one of five businesses coming to Winthrop Town Centre, located on the corner of Bloomingdale Ave. and Providence Rd. in Riverview. With close to 400 members, the chamber’s next big event is its annual Multi-Chamber Business After Hours, scheduled for Tuesday, August 10, from 5:30-7:30 p.m. at South Bay Hospital, located at 4051 Upper Creek Dr., Ste. 103, in Sun City Center. Participating chambers include Apollo Beach, Greater Riverview, Ruskin SouthShore and Sun City chambers of commerce. For more information on the Riverview Chamber, please call 234-5944 or visit www.riverviewchamber.com. Winthrop Liquors, touting itself as the “first of its kind,” and “a new experience in spirits,” is currently open in the plaza, offering cigars, beer, liquor and wine. Owner Tom Manchesi said the store will host a grand opening on Friday, August 27. The event is scheduled from 5:30 – 8:30 p.m. and will have live music, food and drink. Both The Riverview Chamber of Commerce and The Greater Brandon Chamber of Commerce will do an official ribbon cutting at 5 p.m.
Manchesi and plaza developer John Sullivan are asking for a $5 donation, of which 100 percent will go to local charities. Donations and reservations can be made in advance with The Brandon Community Foundation by calling 689-6889 or the Brandon Outreach Clinic at 654-1388. 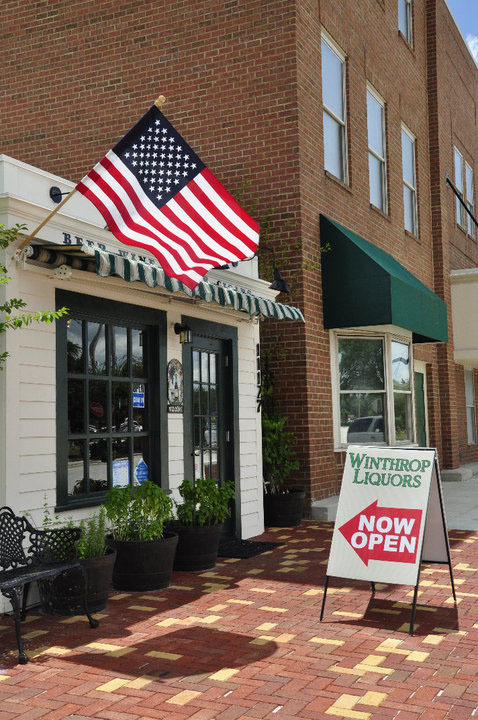 Located at 11127 Winthrop Market St., next to Green Iguana Bar & Grill, the store can be reached at 382-9463 or info@winthropliquors.com. More information is also available online at www.winthropliquors.com. Lady Chameleon, which used to be situated within a kiosk at Westfield Brandon, recently opened a storefront offering Miche bags, Sierra’s Flexible Fun Footwear and Me Beads. The store, with the slogan, “Embracing the Ever-Changing You,” will be located at 6030 Winthrop Town Center Ave. in Riverview, next to Starbucks. The store will be open for shopaholics Monday–Saturday from 11 a.m.–7 p.m. For more information, please call 421-3220 or visit www.ladychameleonllc.com. Sketch and Sip, a unique instructional painting class, has found a new venue for hosting classes within the Winthrop Town Centre, which is slated to expand, as developers have only built 10 percent of what is planned. Located behind the Times Building at 11248 Winthrop Main St., Ste. B in Riverview, the studio has already hosted its first class. August is also Sketch and Sip’s second anniversary. In its two years, it is estimated that close to 100 paintings have been created for a class, with some paintings being used for more than one class. The new studio is 650 sq. feet, able to accommodate between 20-25 people. For larger parties, such as birthday parties or bridal showers, Sisco says she is able to rent the Winthrop Barn Theater. Sketch and Sip’s new location will have one class per day, Monday–Friday at 7 p.m. and two on Saturday at 2 p.m. and 7 p.m. To create a canvas painting, the cost is $40. For a wine glass, the price is $18. Owner Patty Sisco plans on hiring one-two more artists to help teach classes at the studio and will also have guest artists, such as an 87-year-old woman who will teach a gourd class. “For my repeat customers, I wanted to give them something different to do,” Sisco said. For information on when guest artists will be coming to Sketch and Sip, residents are encouraged to sign up for the company’s newsletter. Sisco will still continue to offer what she now calls “satellite classes” at Pottery Patch in Valrico, DaSilva’s Coffee House & Roastery in Lithia and Café Kiln in Tampa. The Joint PT, a privately owned physical therapy practice focused on the one-on-one treatment approach, with the motto “Flexibility. Mobility. Recovery,” recently opened in Winthrop Town Centre as well. All patients are treated by physical therapist, Earlee Salas, versus assistants and/or machines, and the practice is unique in its working hours and the fact that all of the staff is bilingual. Services that The Joint PT treats include orthopedic and sports injuries, muscle imbalances, post surgical rehab, arthritis, osteoporosis, neurological disorders, spinal care, geriatric care, automobile and work-related injuries and massage therapy. “Our patients classify us as the boutique of physical therapy and we’re very proud to be in the area,” said Cyndie Salas, director of operations for The Joint PT. The Joint PT is located at 11256 Winthrop Main St., Ste. A, in Riverview. For more information, please call 443-5749 or visit www.thejointpt.com.